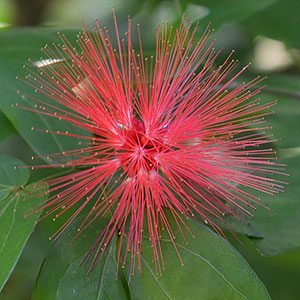 Grown for the attractive ‘Powder Puff’ like flowers, Calliandra are a wonderful sight when in full flower. They are a plant best suited to warmer climates, however well worth a try in cooler areas if you have a protected position. 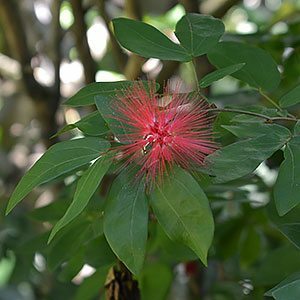 Calliandra are an attractive shrub that grow best in subtropical to tropical gardens but can be grown in sheltered warm positions in warm temperate areas with a little luck. A number of species including Calliandra haematocephela or ‘Red Powder Puff’ are used in landscaping. C. eriophylla has been used as a bonsai specimen, with its attractive purple flowers it makes a statement. Seeds require a little treatment to allow germination (scarification) this involves breaking down the hard outside coating to speed up,the process. Scarification can be by soaking in cold water, mechanical abrasion, or a hot water treatment, a cold water treatment of soaking for 2 -3 days is the easiest. Calliandra species generally require a humus rich moist but well drained soil, they grow in full sun to part shade and will spread to 2.5m depending on conditions. The main flowering period is Spring to Summer, however they can also produce flowers in winter and autumn. Height – To around 4 – 5 m, usually lower growing to 3m in cultivation. Growth rate – Medium to fast depending on conditions. C. surinamensis is the ‘Pink Powder Puff’. C. tweedii or Red Tassel Flower is a smaller growing species. They do not seem to tolerate frost at all. Species such as C. calothyrsus are also used as fodder crops and for fuel in some countries. Plants can be pruned in spring to maintain shape if required. Plants are difficult to obtain in Australia at present however seeds are sometimes available for sale online.